My flowers continued to bloom. This was our first year growing Gladiolus, they were a success! We hosted a July Fourth party and I baked an apple pie, crust and all! We have finally started biking again, and can't get enough! My veggie garden has made a few things. 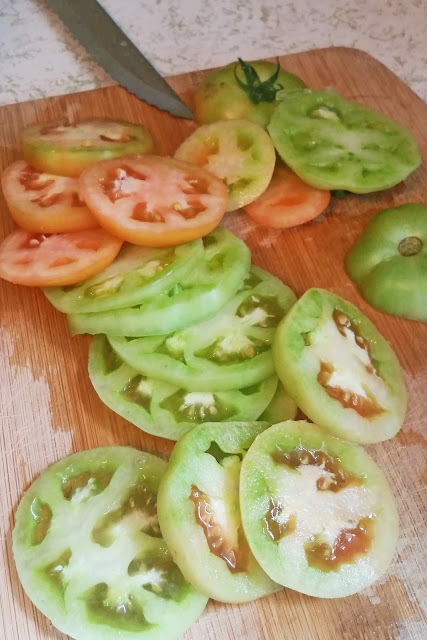 We have loved making fried green tomato sandwiches. July ended up being a pretty good month. We haven't been doing as many outdoor activities as I would like, but it has been just so darn hot outside. Like the type of hot where the air feels thick, and you break a sweat even when standing in the shade not moving. It makes me feel like I'm going to suffocate. I am not cut out for living in this kind of heat.. But, we're in the last month of summer now and it should be cooling down a bit. I used to hate August, it was by far my least favorite month. But now I have grown to like it. It's kind of a last chance to squeeze as much fun out of summer as you can, and the feeling that fall is just around the corner is always exciting. But perhaps my favorite part of August, is our BEACH TRIP. I love the beach so much and I am stupid excited for our trip next week. I hope everybody has a lovely month ahead!